Minneapolis Business Litigation Attorney Practical Counsel. Aggressive Protection. Creative Solutions. At MKT Law, PLC, you will work directly with the experienced litigator you hire, benefitting from the representation of a strategic, results-driven legal advocate. We have the experience and insights necessary to represent individuals and businesses in the most vigorously contested cases. Our Minnesota lawyers attack every legal matter with the zealousness and tenacity called for to protect you and your business. From candid advice on the enforceability of your non-compete agreement to complicated shareholder disputes, you can expect our litigation lawyers to provide you with honest, forthright advice. MKT Law serves clients in St. Paul and throughout the Minneapolis metro area. They understand the needs of your business and the devastating impact legal matters can have on your bottom line and ability to compete in the marketplace. Most other law firms and attorneys are “late adapters,” or even “luddites,” when it comes to technology. They are stuck practicing law the same way lawyers did in the 20th century. Our litigators at MKT Law use 21st century tools and technology, making full use of the latest software and apps designed specifically for lawyers and adapting technology used in other fields to fit our current needs and to assist in effectively, efficiently, and economically handling your case. At MKT Law, the cutting-edge, fearless, and competent use of technological tools helps our litigation attorney to prepare stronger cases faster and more thoroughly than ever before. Whether it is for a case-deciding motion, settlement talks, or a trial, by leveraging the latest technology, MKT Law can better understand and more persuasively present your case when representing your business. 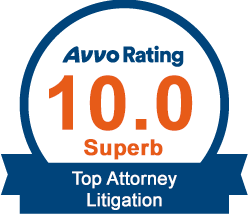 We’ve also earned honors such as being included in Super Lawyers® Rising Stars. Our lawyers are backed by recommendations from clients and peers. Find the timely, pragmatic advice you need. Schedule your appointment today! At MKT Law, our main concern is to protect your rights in business litigation. You will receive an honest assessment from a lawyer who understands sometimes you have to aggressively pursue a case to protect your rights, while other times it is best to cut your losses and get back to successfully running your business. With a business-related background, our experienced attorney crafts tailored strategies that best suit your individual needs. We are always making cost-benefit analyses along with you to make sure we are on the right track and employing the most effective way to address your legal problem. MKT Law serves clients throughout the Minneapolis / St. Paul metro area in Minnesota, as well as across the nation and around the world. Whatever business litigation matter you are facing, you can expect to work one-on-one with a highly qualified business lawyer who addresses your unique needs.